Clasp/Buckle: Stainless steel Rolex deployant clasp stamped 10-9 and marked U.S.A. The reference 6239, the first Cosmograph Daytona introduced into Rolex’s collection, was launched in 1963, and scholars generally agree that the earliest 6239s began around the serial number 922’900. 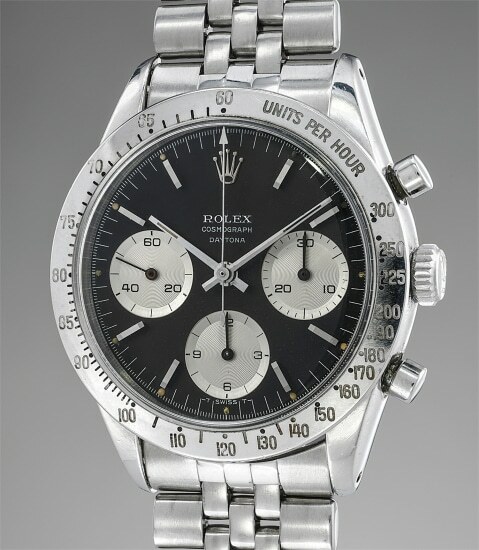 The earliest 6239s had no Daytona logo on the dial, with the commonly accepted reasoning being that Rolex wanted to capitalize on society’s fascination with space travel, but also to concentrate their marketing efforts on a specific geographic location. That first full year of production, 1964, Rolex sponsored both the French Le Mans and the American Daytona motor sport endurance races. The Cosmograph was initially marketed as the ‘Le Mans’, but Rolex quickly settled on the American ‘Daytona’ product name, which would soon begin appearing on dials. The earliest dials with the ‘Daytona’ designation are rare and highly coveted, as they are typically printed in a smaller script, centered below the ‘Cosmograph’ designation closer to the middle of the dial. This disjointed appearance has given way to the term “floating” or “suspended” as a descriptor for these dials. The present watch, with the serial 1’090’462, is one of the earliest examples of any Cosmograph reference to appear publicly with the Daytona logo and the earliest example to appear with black dial and silver subsidiary dials. Its manually-wound Valjoux caliber 72B is marked ‘ROW’ indicating export to the United States, and is fitted with a stainless steel Rolex Jubilee bracelet also stamped ‘United States’.